The website was founded in 2003 by veterans of the global financial industry, Finexo was established with the intention of bringing anyone who wishes to invest and profit from the trading of currencies into the Forex trading market – an industry once thought to be the preserve of professional traders. Today Finexo is one of world’s fastest growing online Forex brokers and the company continues to provide an accessible yet professional currency trading experience for all of its investors. The state-of-the-art trading platform combined with unrivaled customer support and service has ensured that Finexo is in a league of its own. Finexo places significant emphases on client security and they adhere to strict regulations. Their corporate philosophy is based on maintaining the highest of standards in regard to their business practices. 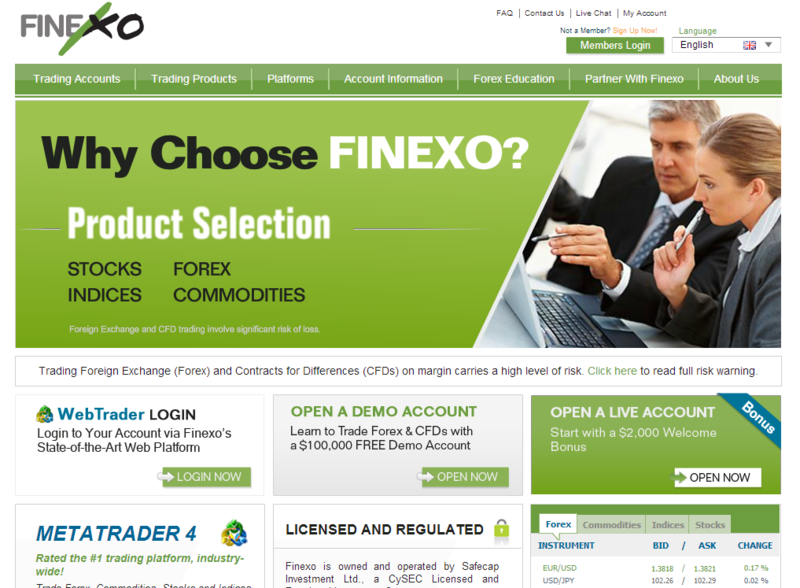 Since March 10th 2010,Finexo website is owned and operated by SafeCap Investments Limited, a Cyprus Investment Firm (CIF), which is licensed and regulated by the Cyprus Securities and Exchange Commission (CySEC) under license no.092/08 and is registered with such global regulatory authorities as the FCA, FSB . As a Securities and Exchange Commission of a European Union member-state, CySEC ensures that all regulated companies adhere to strict financial guidelines. Finexo’s primary belief is that the Forex market is not just for professional investors, traders or institutions; rather that the Forex market should be accessible to everybody. It has been Finexo’s mission to both educate and guide individual investors while providing an unparalleled trading platform which traders can use effortlessly. By simplifying the process, educating investors and standing with them 24 hours a day, Finexo has become the premier Forex broker for every level of investor. With a cutting edge trading platform and the ability to trade with ease from anywhere, via computer or mobile phone, trading is easier than ever before. Finexo’s development team is always working to create new products designed to help investors make the most of their trading experiences. Through innovation, Finexo is leading the way in currency trading. To see who is the best Forex broker click here!